Dive into warmth and brightness with Silk Chassis’ deep orange silk scarves. 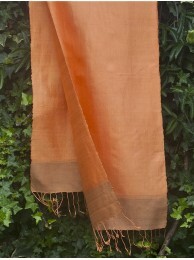 In Saraswati silks, from India, there’s a sizzling Indian pink and orange. Guanyin silk scarves includes saffron, edged with olive – one of a kind, this scarf took three days to weave and longer to natural dye. Thus, it’s one of a kind.